The Christmas commercials have started, which means it almost time for Halloween! If you are looking for historically haunted activities Philadelphia is the place to be. Check out our top 5 favorite places to go ghost hunting, and maybe you will even pick up a historical fact or two. Of all of the haunted attractions this should be number one on everyone’s list year round. 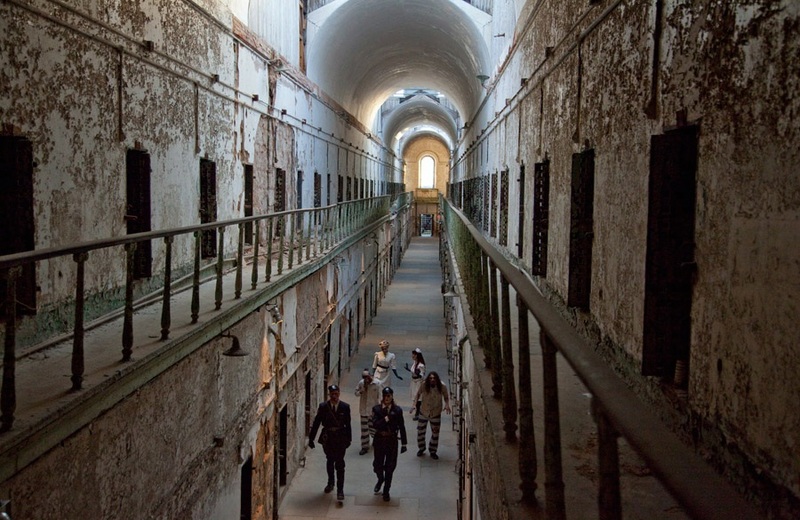 A great destination for locals and tourists alike the Penitentiary is open all year round, but during the fall months they turn it into the scariest Haunted House in the city. Even when the spook level isn’t being increase by the actors and theatrics of Terror Behind The Walls this destination has an unworldly feel. The concrete structure makes for a cold tour of jail cells of infamous career criminals. Being in the recreation yard surrounded by watch towers and stone walls is enough to put anyone on edge. So whether you prefer your tour at night with the zombie actors, or want to the more informational route, you are sure to be in for a scary time. Just outside of the city is this haunted attraction that will strike fear from the second you lay eyes on the run down playground that leads to the towering architecture of this State School. Rising out of the wooded area it’s so ominous that you want to believe it was created for an old movie set and not a former State School and Asylum. The hospital was opened in 1908 and has since had a sorted past, closing in 1987 after a court case brought to light the cruel and unusual punishment that was widely used on patients. The school was abandoned and left untouched for years, leaving behind unsettling scenes of rundown playrooms and untouched hospital quarters. In 2010 the Administration Building was acquired by the Preservation Alliance of Greater Philadelphia and repurposed into a terrifying haunted house. The tour includes much of the furniture and equipment that was left behind, and takes you through the eeriest parts of the building including the old morgue and the tunnels below that are unlit and weave throughout the property. This tour is not for the faint of heart, but they do offer a daytime photography tour if you would rather experience the school during the day. Considered one of the most haunted places in America, the oldest Revolutionary War Battlefield is still completely intact and known for its ghost sightings. Rumor has it that women’s screams and wondering soldiers can still be experienced to this day. You can join in on a Candlelight Ghost tour to try your hand at spotting the undead, or join them for their first annual Halloween Party where you can spend the night dancing with humans and immortals alike. If you are really brave you can join them on October 29th for a sleepover that includes ghost hunting and tours of the famous grounds. This attraction wins for best name. But also provides historically haunting facts when you visit the city’s creepiest estate. Built in 1744 this Germantown Estate hosted the Battle of Germantown, which left the blood of a British General splattered over the parlor which is still visible today as a reminder of the battle. The estate was also used by the Grumblethorp family to hide from yellow fever, and a ghost of the orphan girl that lived with them during the hide out is still said to roam the grounds. You can still take tours of the estate which is sure to offer a creepy tour all year round. Our last stop on the historical haunts trip is this inn that has been home to over 200 years of unsettling events. This Inn is built on land that was previously owned by William Penn and was opened in 1704. It was frequented by many soldiers and generals during the Revolutionary War and became a famous attraction in the 1800s even being visited by the author of horror himself, Edgar Allen Poe. It is said to be haunted by Hessian Soldiers, yet has recent gruesome history. In 1996 the co-owner of the inn shot and killed his business partner in the Inn. He testified that it was not him that shot his business partner, but his scorn mistress, as an act of revenge for refusing to leave his wife. Soon after the mistress killed herself.